This piece is an update to my two earlier pieces examining the unidentified munitions alleged to have been used in chemical weapons (CW) attacks in Syria. It should be stressed that this is still a preliminary analysis of the photographic and videographic material available. It is still not clear whether these munitions carried a CW payload, nor are their origins yet known. It appears increasingly likely that there are munitions of this variety produced in at least two different sizes. You can find the first piece, offering a preliminary analysis of the munitions, here. You can find the second piece, with a more detailed analysis and examination of the launch systems, here. 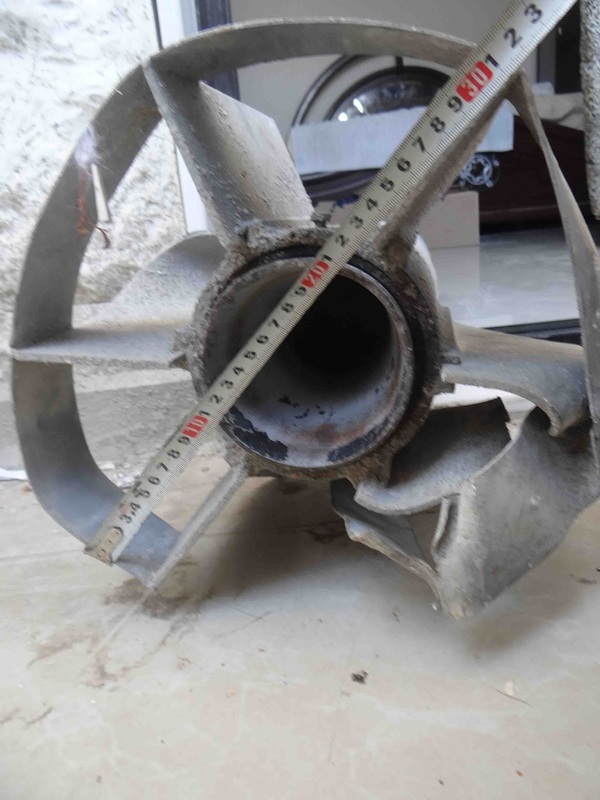 New images and video of the alleged CW munitions in Syria have surfaced in the last few hours. These include higher-resolution photos of recovered components from one of these unidentified munitions, as seen in the image below, and the gallery at the bottom of this post. These images show the tail fin assembly to be somewhere in the region of 300mm in diameter. In some of the previously observed images and videos it appears that the tail fin assembly of the rocket is slightly smaller in diameter than the forward, payload-bearing section of the rocket. A diameter of 333mm or slightly less would be consistent with the munitions being fired from Iranian Falaq-2 type launchers, or similar copies or derivatives. One of the images shows the warhead baseplate quite clearly, with two access holes visible. It is not yet known what function these serve, though they may be fill ports, or related to a fuze or bursting charge fitted to the munition. In the image below, you can see that the top port is missing its cover, revealing a smaller diameter fitting within. In the case of a liquid fill, the gap between these two may have housed a rubber washer or gasket, or a sealant of some variety. New video of one of the munitions has also been documented. The video, embedded below, shows one of the rockets captured by the ‘Holy House Brigade‘ as it is being disassembled. The rebel group are harvesting what looks to be a high explosive (HE) fill from the rocket. The fill and the thin-walled casing can be seen clearly in the video, and in the image below. 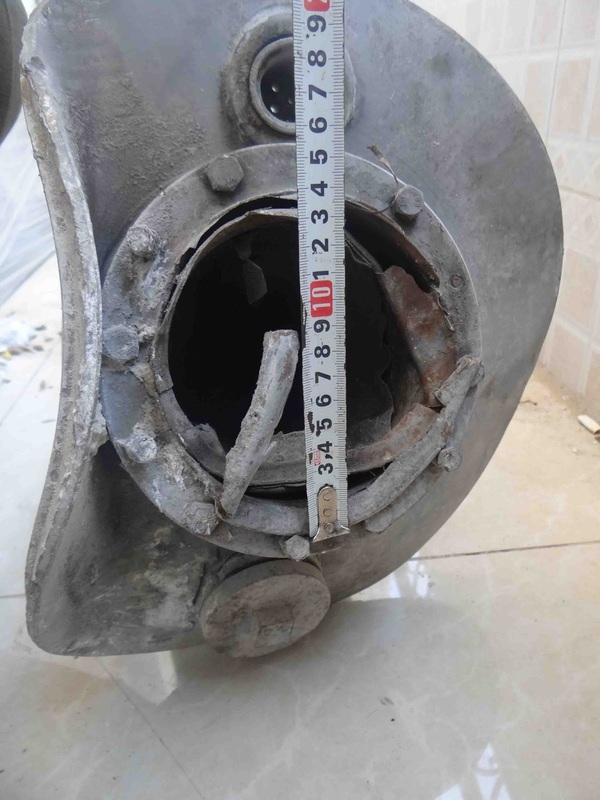 The physical characteristics of this munitions largely match with one of the munitions seen in Khalidiya, Homs (and discussed in my first post on the matter). Also visible is a black band around the munition, with black numbering visible in the video. Munitions have now been documented with both black and yellow markings, and black and red numbering, though it is not yet clear what these signify. Unlike the munition pictured in the images above, the munition featured in the video and image below (and the similar rocket seen in Homs) appears to have only one hole or port in the warhead baseplate. Whilst not conclusive, this could point to a difference in fill type. Although it is difficult to ascertain from the videos and images we have seen so far, it appears increasingly likely that the munitions may have been produced with varying rocket motor lengths, payload diameters, and/or payloads. For example, the launcher and munition in this video appear to be of a larger diameter and greater length than the Falaq-2 (333mm) systems seen in Syria. However, the construction of the munitions and, for the most part, the launcher itself seem to be very similar. On the other hand, the measurements taken from the munitions above, in conjunction with this photo indicate that Falaq-2 systems or similar copies or derivatives are likely in use with the smaller diameter munitions. More definitive information is required. My thanks to Eliot Higgins, as well as a confidential source in Syria, and several EOD/CW specialists who wish to remain anonymous. Looking at the rust and crud visible in the second photo makes me think that these weapons look *old*. Now, by this stage in the conflict I am sure that they are sorting through the parts of the arms dumps that stock rotation forgot, you know, the stuff you get conscripts to move. But, even so, the coloured bands should identifiy the warhead. So, they either re-filled an FAE round with “whatever” or this was an old cw round shipped in from “wherever” that had been deliberately mislabeled. If mislabeled, it would be instructive to find out if that had had been done recently. We’ve seen marking bands in black and yellow, and numbering in black and red. Still no indication of their particular significance, though. I had a quick look around the web and found a picture of a SLUFAE round – it too has a yellow band. If these weapons are “inspired by” SLUFAE then maybe, just maybe, they copied US practice. What exactly that convention would be I don’t know. Some of the numbering looked post-manufacture, posssibly a sequential stocktake audit identifier.